Art in the Stations is a visual treat, and anyone concerned with the cultural revitalization of Detroit, whether an art lover or not, should find in this work, something to enlighten. The art in the Detroit People Mover stations is a world-class collection with a uniquely Detroit sensibility. When the People Mover, Detroit’s elevated transit system, was being planned, the stations were designed simply to serve as basic points of entry and departure, but in 1984 Irene Walt and the Downtown Detroit People Mover Art Commission, a volunteer committee also known as Art in the Stations, undertook the task of incorporating major works by contemporary American artists into the thirteen People Mover stations. As a result Detroit now has one of the most impressive collections of public art in the country. With lush photographs by Balthazar Korab and accompanying narrative, Art in the Stations examines each of the gorgeous works that grace the People Mover stations. The works of ten Michigan artists reference Detroit whenever possible: the mosaic in the Cobo Hall station depicts seven full-scale automobiles; at the Grand Circus Park stop, a bronze life-sized figure reads the Detroit Free Press and Detroit News; the Financial District station is titled "‘D’ is for Detroit"; and the art in four stations was constructed entirely of Detroit’s world-renowned Pewabic pottery tile. 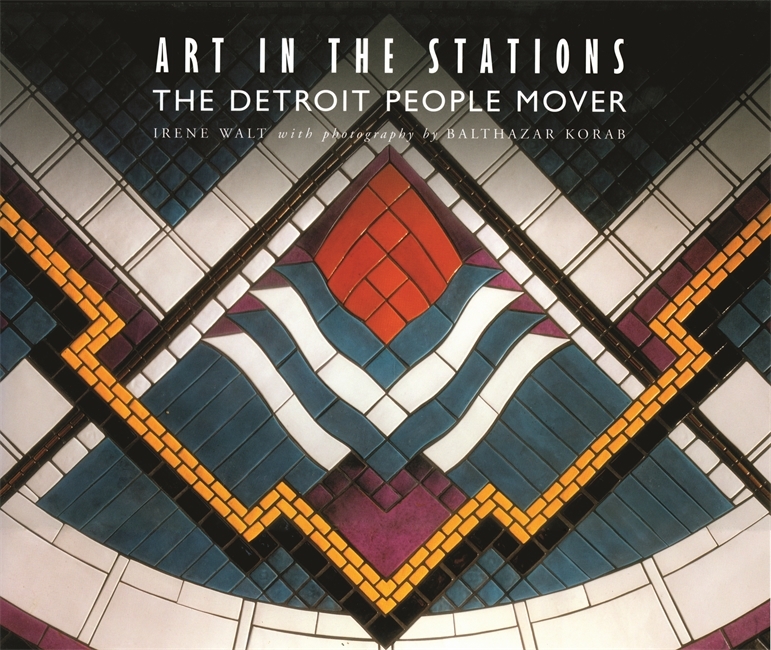 A stunning guide through the city’s People Mover art installations, Art in the Stations documents Detroit’s rich culture and testifies to the perseverance and hard work that made the display of this art possible. The Book Collaborative was formed in 2000 by Irene Walt to oversee the preparation of material for this book. Ms. Walt served as chair of the group; other members included Dorothy Brodie, Grace Serra, Patrice Merritt, Balthazar Korab, and Monica Korab. Irene Walt is well known for her dedication to placing art in public places. She has volunteered her time and energy to many organizations dedicated to improving the public spaces of Detroit, including the Detroit Receiving Hospital where she worked as art advisor for many years. Ms. Walt has received numerous honors for her work, including an Honorary Doctorate of Human Letters from Wayne State University. Balthazar Korab has been an independent photographer of architecture since 1958. Trained as an architect in his native city of Budapest, Hungary, he is known throughout the world for his work. He is the author of several books on architecture, and his photographs are in many prestigious public and private collections. A loving tribute to the collection of fine art in the People Mover stations." With text by Irene Walt, head of the volunteer Art in the Stations Commission, and photographs by internationally known architectural photographer Balthazar Korab, Art in the Stations documents the project to install this artwork from its 1983 inception through the final installations in 1992. As a tribute to the skill and craftsmanship of the artists themselves, Art in the Stations is a visual treat, and anyone concerned with the cultural revitalization of Detroit, whether an art lover or not, should find in this work, something to enlighten.